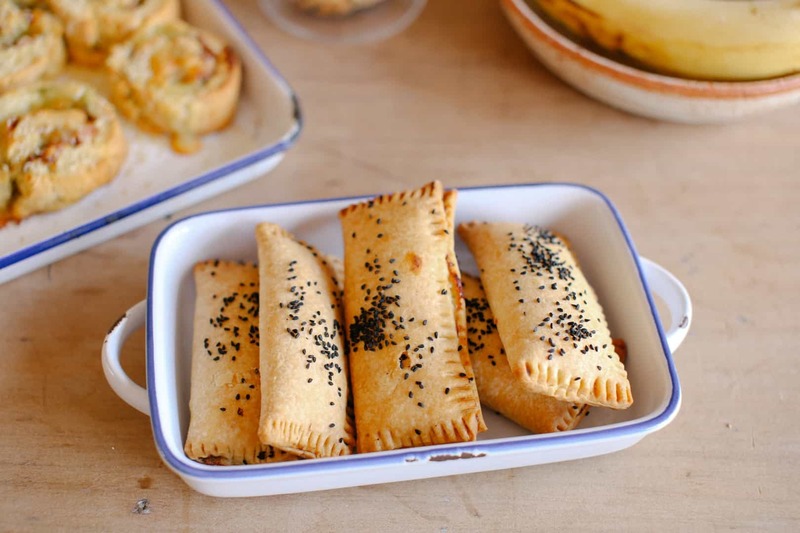 Another fantastic lunchbox filler – these can be even easier if you use frozen shortcrust pastry. You can also make then freeze the uncooked pastries and cook them from frozen if that’s easier! Place the butter, flour and salt in the bowl of your Thermomix and blitz to combine. Add a little water and blitz until the mixture resembles rough breadcrumbs. Preheat oven to 200C and line a baking tray with paper. Mix together the spinach, ricotta, egg and parmesan and season mixture to taste. Roll out the pastry on a lightly floured surface until about the thickness of a $2 coin. Cut pastry into 8 or so squares (about 15cm each), roll up the trimmings and place in the fridge to roll out again in a bit. Place a good tablespoon of the ricotta spinach mixture on one side of your pastry square, fold over the other side and gently crimp the edges closed with a fork. Repeat with remaining pastry squares and re-roll left over pastry to finish mixture off. Arrange your pasties on the prepared tray and return to the fridge to rest for another 10 minutes. Whisk together the egg and cream together and brush mixture across the top of each pasty. Sprinkle with seeds and place in the oven for 20 minutes or until the pastry is golden brown.